On March 1, 2019, the state of Ohio joined several other states including Connecticut, Oregon, and Hawaii in banning the use of latex gloves in food service operations and retail food establishments. First proposed in November 2018, these changes are part of the Ohio Administrative Code (OAC) Chapter 3717-1, the Ohio Uniform Food Safety Code. Latex gloves offer numerous benefits including excellent durability and superior stretch characteristics with more elasticity. Because they provide superior barrier protection, they have commonly been used in industries where safety is of the utmost importance – like the food service industry. The only problem with latex gloves is that they can cause allergies. As a result, manufacturers and distributors (including Omni International Corp.) have worked to continually diversify the materials they use for gloves and provide alternative solutions to latex gloves. Because other options are available now that do not cause the same allergic reactions that latex gloves do, states like Ohio have moved to ban products made with natural rubber latex to mitigate potential allergic reactions. With latex gloves being banned, what kinds of gloves are allowed in Ohio and other states that have also banned the use of latex gloves? 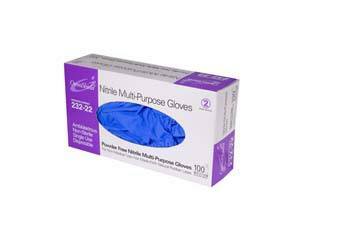 Our nitrile gloves come in different sizes and colors and are ideally suited for food service because they are made of the highest quality nitrile materials available in the world. Developed with the latest technology in nitrile manufacturing, material and formulation along with the most efficient industry-leading manufacturing processes, these gloves offer a very comfortable fit while maintaining a superior level of tactile sensitivity. 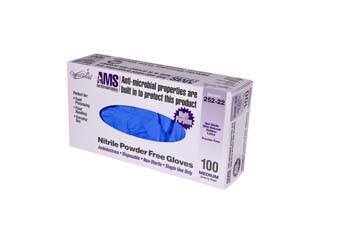 OmniShield™ AMS Anti-Microbial Multi-Purpose Nitrile Gloves utilize built-in EPA Registered Anti-Microbial agents from Anti-Microbial Solutions (AMS) to protect the glove, making them a big step up from the traditional nitrile glove product. 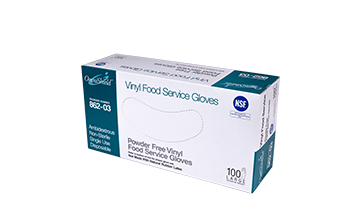 Omni International Corp.’s vinyl and stretch vinyl food service gloves come in the same array of sizes, colors, and applications as our nitrile gloves and are a great alternative to latex gloves. 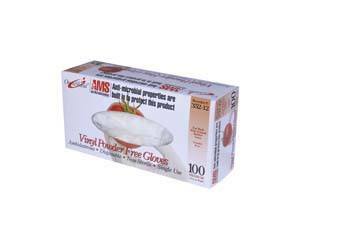 OmniShield™ AMS #352 Series Anti-Microbial Multi-Purpose Vinyl Gloves are made from the highest quality polyvinyl chloride and plasticizers available. The OmniShield™ #862 NSF Vinyl Powder Free Food Service Gloves meet the rigorous quality standards of ISO 2859 and are certified to meet NSF Protocol P155, so you know it’s a glove you can count on to protect consumers and employees. Omni International Corp. is excited to expand our food service and food processing industry product selection with our new cast polyethylene (CPE) gloves. Do you have any questions about latex gloves, latex allergies, or how to choose the right alternative material for your food service customers? Leave us a comment below or contact us directly today!